I’m fairly certain that I was a sailor at some point in a previous life. I have always faintly heard the siren’s call of the open sea, and boats hold a particular fascination. As a matter of fact, monkey238 and I were married on a traditional three-masted schooner, and that made the day all the more special. And, so, I was filled with great glee when the opportunity arose to take an advanced look at Fleet, a game all about boats, the open sea and fishing. Well, that and daft cunning. And engine building. And bidding. But I’m putting the stern ahead of the bow. Before diving into the salty depths of Fleet, it is with no trace of hyperbole that I must first state that, after playing, I have never been more excited to support a Kickstarter campaign. 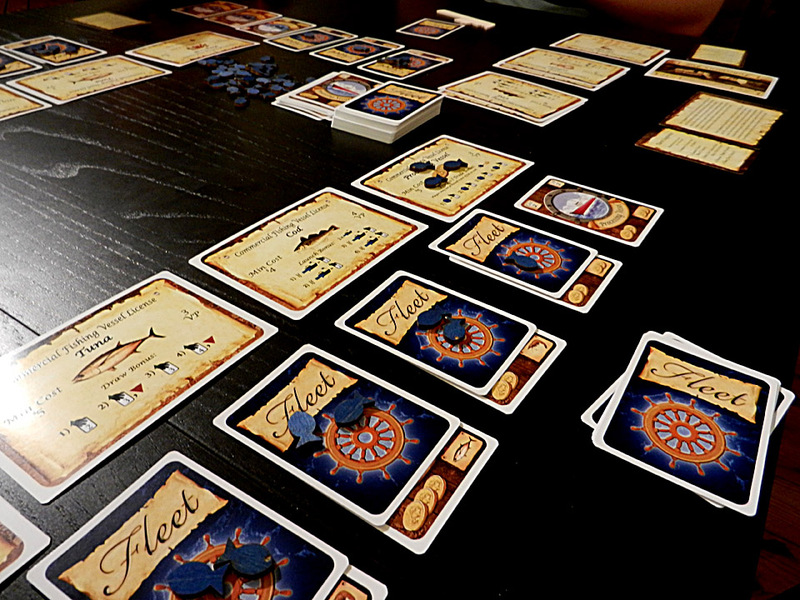 Fleet is, hands down, one of the most enjoyable card games that I have had the pleasure of playing in recent memory. Many have compared it to Race for the Galaxy and San Juan, and I will speak to those comparisons shortly. But let it be said that I would rather play a game of Fleet than either of those gems – and most of you dear readers may realize that statement is bold, indeed. The Fleet prototype. The large license cards will be the same size as the other cards in the final version. The nuts and bolts of Fleet are thus: Each player starts with a hand of six base ships which they will use as money to win and pay for bids for fishing licenses, to launch ships, and then to captain those ships in order to catch fish and earn victory points doing so. Sounds easy, right? Oh, it totally is. But the real fun starts when players start bidding on and acquiring licenses which grant them special advantages during certain phases in each round. Since we’re talking about licenses (and they really are the star of the show), it’s probably important to cover how players acquire them and what they can do. At the beginning of each round, the start player will choose a license and make an opening bid on that license (if they choose). The bidding goes round and round until one player has the highest bid after other players have passed. This continues until all players have passed when it is their turn to make an opening bid or when all have acquired a license. It’s a very simple yet effective bidding mechanic that keeps the game not only moving quickly, but also ratchets up tension when there is a particularly useful license on the auction block. Once acquired, the license can be used for a few things. First and foremost, players need a particular license in order to launch a ship from their hand. For instance, to launch a Shrimp boat a player will need a Shrimp license. However, once in play, that license grants an ability regardless of whether the player actually has a boat of that type in play. As another instance, the Shrimp license decreases the amount of money that a player must pay in auctions or when launching ships. So, since Shrimp boats only have a cost of one, as long as that player has one Shrimp license in play, they can launch Shrimp boats for free! And that’s only the beginning of the nastiness that a Shrimp license can unleash. License abilities increase when a player acquires multiple licenses of that type. There are four of each type of basic license in the game, so players can choose to diversify and try for different licenses, or wait and specialize, gaining some pretty powerful abilities with stacked licenses. In addition to bidding on and acquiring licenses, the rest of the game is fairly straightforward fare for a game that revolves around building an efficient Victory Point engine. Each round a player may, on their turn, launch a boat if they are able to pay a launch fee and then may take a card in their hand, if one is available, and place it face down on the ship card to indicate that the ship is captained. That player is then able to place a fish crate onto the boat during the fishing round. Each boat is able to hold a maximum of four fish crates, each of which equate to one Victory Point at the end of the game. And as far as Victory Points go, acquired licenses and boats all count toward the final Victory Point tally which helps to keep the final scores pretty tight. And those are the basics of Fleet. 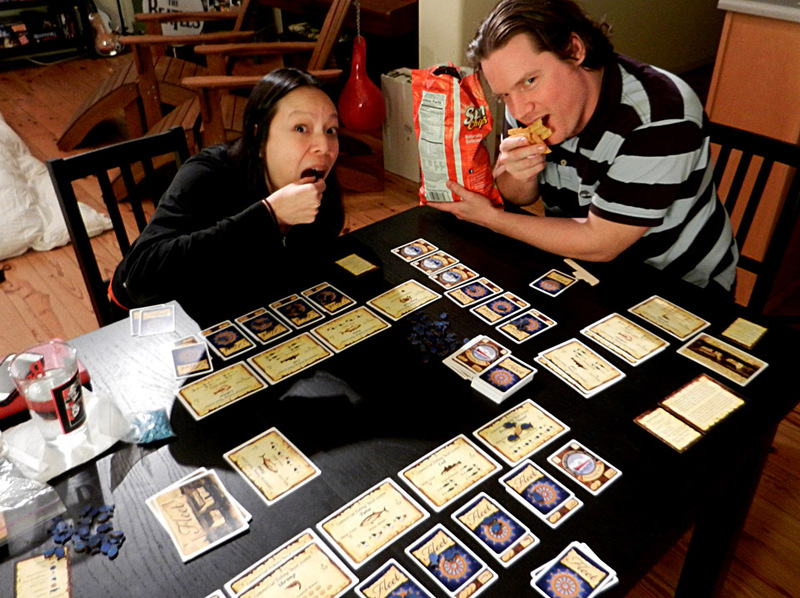 The real meat of the game lies in the various combinations of licenses that a player is able to acquire throughout the game, how patiently and skillfully they can bid cheaply and counter-bid effectively in order to deplete others of cash, and how efficiently they can manage their Victory Point engines until the very last turn. As mentioned, many gamers have likened Fleet to card-based classics like San Juan and Race for the Galaxy. Although I would certainly hasten the addition of “classic” to the attributes of Fleet, I’m not sure that I would immediately draw comparisons between it and these aforementioned games. 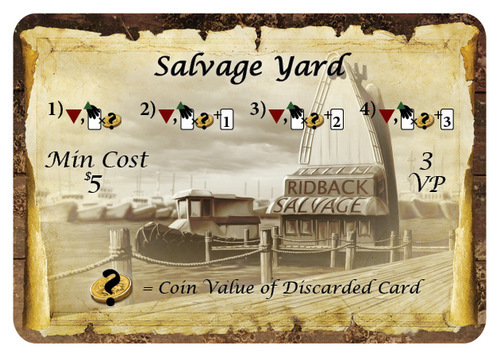 San Juan does have a familiar engine-building mechanic and the ability to use cards for both buildings and resources, but that is where any similarities lie. Fleet is far more flexible and far less harsh in luck factor when a player draws a card that no one else can seem to locate (Library, anyone?). Race for the Galaxy may, at first glance, have a similar chaining mechanism where cards relate to one other and help to gain other cards, but the iconography and gameplay is far smoother in Fleet. Overall, I find Fleet far more similar to the board games Puerto Rico, London and other engine-building Euros, but much more accessible, free-spirited and friendly to the casual gamer. Fleet is usually best with two or three other fishing freaks. So, with such accolades heaped upon it, is Fleet the perfect game? Almost, but not quite. 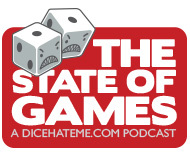 There are two drawbacks that would keep me from naming it the early contender for Dice Hate Me Game of the Year: Two-player gameplay and overall depth. After playing Fleet numerous times with two, three and four players, I can safely say that Fleet is optimized for three and four. 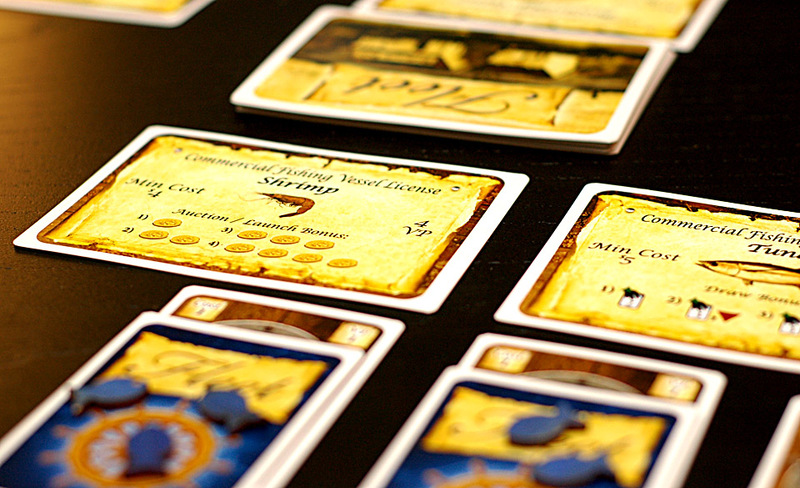 Most games that contain bidding can only achieve the right amount of tension with three or more players, and Fleet is no exception. The rest of Fleet’s gameplay is perfectly fine with two players, and the race to the finish in engine-building is taut and palpable – but it’s not quite enough to make up the difference. Monkey238 and I have already devised a couple of variants that may increase the tension or at least open up gameplay around bidding, so I’ll be sure to report back if those attempts are successful. At the very least, Fleet’s flexible structure definitely allows for variants and house rules to suit varied styles of play. One more area in which Fleet slightly falters is in depth of play. Within the first few games, most players will find a myriad avenues for strategy and tactics from the various licenses, boats and combinations therein. However, after breaking through the greenhorn stages, most players will start to see the most obvious patterns and licenses to string together for victory. The saving grace for this comes in bidding – because luck only applies in the types of licenses available from round to round, there is no way to account for the human factor when acquiring licenses. Sometimes you’ll get a deal, and sometimes some jerk will make you pay 10 bucks for a Processing Vessel. Despite the slight drawbacks mentioned above, I have no reservations in recommending Fleet, especially for the price. The minimum price on Kickstarter is $20 for a single copy of the game. Quite frankly, that’s a no-brainer. For $25 you will receive a copy of game as well as 8 variant captain cards and an exclusive Salvage Yard license which is very powerful. Did I mention exclusive? On top of that, the Fleet campaign has been going full steam since its launch, and the designers – Matt and Ben – have been introducing some really choice stretch goal rewards that help to round out the game and really add to gameplay, increasing the depth and addressing one of my aforementioned concerns. Overall, Fleet is one game that I am more than proud to have supported on Kickstarter. With its quick, accessible and flexible gameplay combined with fantastic art and production values, I am looking forward to September when I can dock this rusty prototype and set sail with one of my favorite games of 2012. 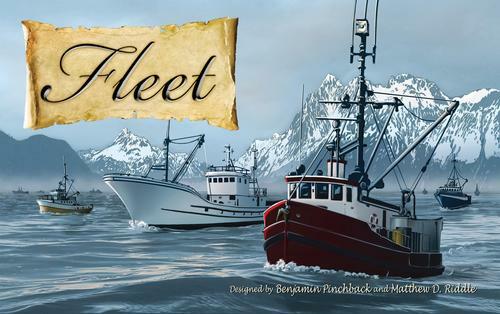 Fleet is a game for 2 to 4 bold boatsmen by Ben Pinchback and Matt Riddle for Eagle & Gryphon Games. It’s currently available on Kickstarter, starting at $20. I think, not only were you a sailor in a previous life, but we were on the same crew. I have heard rumblings about this game from a few sources, but your writeup just put me over the edge to joining the Kickstarter. I have to admit, I didn’t pay that much attention to the mechanics. The idea of “needing a shrimp license” was my kryptonite. Sigh… I’m such a sucker for a theme! Lorien – You’re not the only one who is a sucker for theme! And if you were a sailor like me, then you will absolutely love Fleet. It tickles a certain part of your gamer brain and satisfies theme craving, all at the same time. By the way, we got the documentary a few days ago – I’m looking forward to sitting down and watching as soon as I get VivaJava to the printer! Matt – Of course – thanks for the prototype and the opportunity! Best of luck with the rest of the campaign. I actually was a sailor in this life, so the theme totally works for me. My wife and I were not crazy about the iconography in RftG, and San Juan just made us wish we’d spent the time playing Puerto Rico instead. But Fleet sounds like the ship that finally came in. I appreciate your caution about its shortcoming as a two-player game; that’s always an important trigger-pulling criterion for me. I hope you’ll have the opportunity to follow up with ways that you and Monkey238 find to make it work. You just convinced me. I’ve been watching this project since it came out, debating whether to support it or not. But after this review, SOLD. MGP – Excellent! You will not be disappointed.